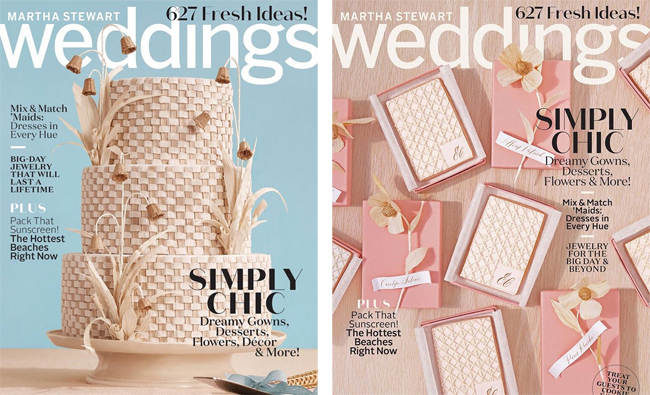 The editors of Martha Stewart Weddings have printed two covers for the summer issue of the magazine. Both covers feature confections by Wendy Kromer: one is a flawless cake with a woven icing motif and the other features individually wrapped cookies (very fancy cookies) all pretty in pink. The issue features beautiful bridesmaid's gowns, new takes on 'casual' summer wedding dresses (think boho-chic) and my favourite feature is all about single-serving desserts: remember those fancy cookies? Which cover do you like best? I like the pink coloring of the cover on the right, but defiantly like the wedding cake (left) as the subject matter . Guess replies like mine make designing magazine covers problematic! I've only seen the blue cover on stands. Where can we get the pink? Since it's the printed issue of MSW (cry), I wanted to grab a copy of both. Thanks! Samantha, I believe the pink one was for subscribers. You might try eBay.